Now that it’s well into the new year (isn’t it nearly already Chinese New Year for goodness sake?) I’ve realized I wanted to post about the fabulous gift we got for Chris’s parents and the Coboconk (Coby) cottage. The gift that disappeared into the Canada Post ether, or so we thought. First – context. The Coby cottage is located at the end of a long gravel lane. They consistently were having trouble with people driving into their property who thought the road just continued that way. Then there was a handwritten “private” sign that just had to go. 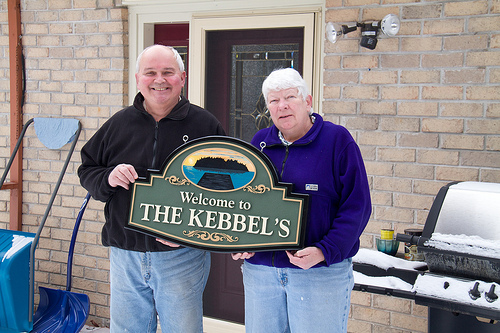 For Christmas, the Kebbel’s needed a proper cottage sign. We looked around for a company who does custom signs and we found The Riverbend Sign Company, located in Apsley, Ontario. 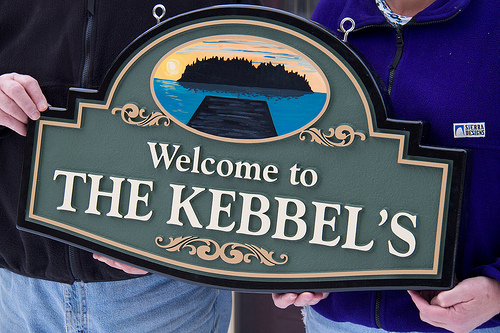 We placed our order, which involved adding a custom image of the Kebbel dock (with some improvising by the fabulous Judith of Riverbend, who added some sunset finesse that I just couldn’t capture in cold grey light of November with my camera). The sign was ordered and shipped just in time for Christmas. Only problem was, it never arrived. The package was insured and all the address information was correct but, no sign. Poor Judith and I were running about, me in Toronto to the local post office, her in Apsley to her postmaster, but to no avail. We had investigations running at Canada Post that turned up nothing. The tracking information only stated that the package had been delivered (to Scarborough! We live in North York!). So Christmas came and went, and Mom and Dad Kebbel got a print of what the sign was supposed to look like, instead of the real thing. Judith and I resigned to file an insurance claim and start over. And then low and behold, on December 29, I was outside in the backyard hanging up a new bird feeder I’d gotten for Christmas when Chris noticed me walking around the side of the house, so he went to the side door to let me in. And guess what was there, between the doors? Dear Canada Post: We appreciate you delivering our package. We even appreciate that you opted to leave it somewhere you thought was safe. But maybe you could let us know about it next time? We rarely use the side door in the winter, so it could have sat there for months without us knowing about it. Anyway, it all worked out. And if you ever need a sign, I think Judith at Riverbend is your woman. She is a darling and didn’t make me feel at all embarrassed about not checking my side entrance. What a lovely sign and gift! We order online a lot and Canada Post leaves parcels in our side door quite often. They are supposed to leave a card in your mailbox saying where they safe dropped the parcel. We have one of their signs at our cottage! (Just south of Apsley), and we visit a friend’s cottage in Coby often – Grandy Road, on Balsam Lake.